The Cebu Journalism and Journalists (CJJ) Gallery officially opened on September 24, 2010 to showcase the vibrant journalism in Cebu. It is the first community media museum gallery in the country. On June 25, 2009, Cebu Citizens-Press Council (CCPC) executive director Pachico Seares had obtained approval for the project from the CCPC en banc, following initial talks between broadcaster Bobby Nalzaro and Seares with Cebu Gov. Gwendolyn Garcia on locating the gallery in the Cebu Provincial Government-owned Museo Sugbo. Then congressman Raul del Mar (Cebu City, north district) offered P200,000 from his Priority Development Assistance Fund to finance the exhibit. Last March 11, 2010, the CCPC en banc approved the memorandum of agreement (MOA) between the Province of Cebu, represented by Garcia, and the CCPC, represented by its president, Dr. Pureza Oñate, to use this space in the Museo Sugbo for the exhibit for 25 years, free of charge. The contract is renewable for another 25 years. 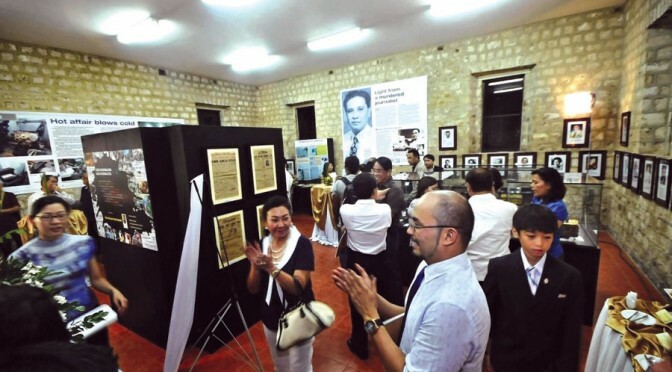 The gallery contains photo frames with captions of pre-war and post-war journalists of Cebu with captions on their contributions to Cebu journalism. It also contains equipment like a Minerva letterpress, an ink knife, radio microphones and a Royal Quick Deluxe typewriter. Play the video below to listen to one of the gallery’s curators.